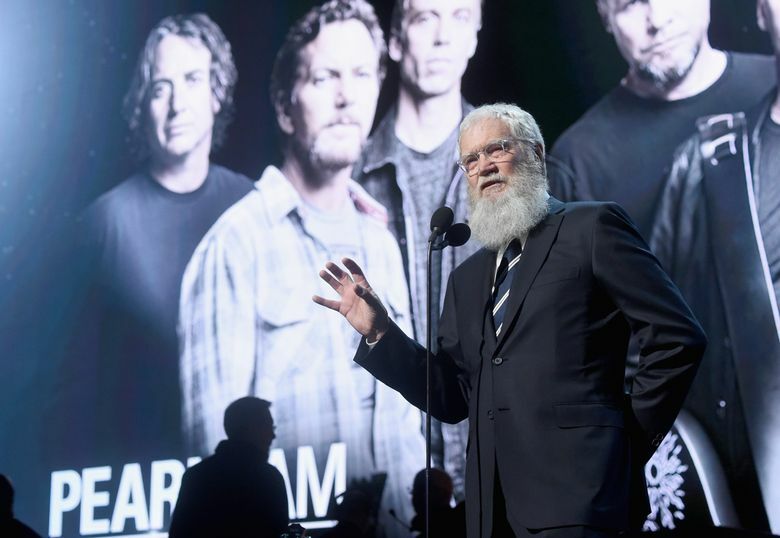 David Letterman paid tribute to the Seattle band at the Friday night ceremony in New York. 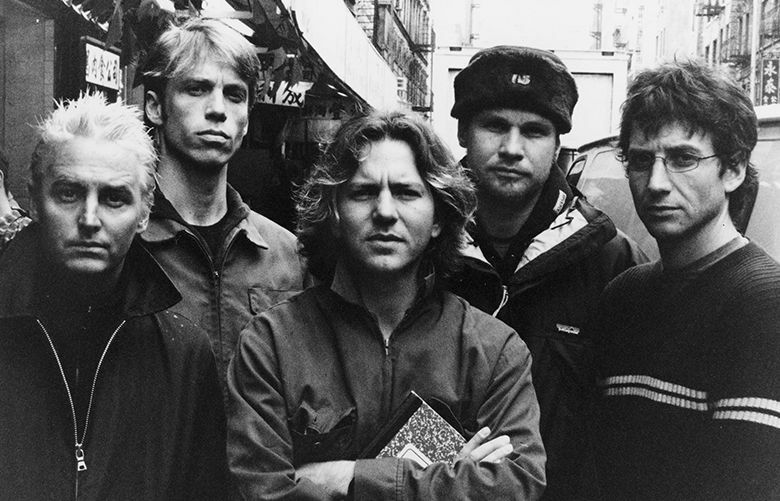 BROOKLYN — If during its youth Pearl Jam might have cast a wary eye at an honor such as election into the Rock & Roll Hall of Fame, that time has passed. The band revealed only sincere appreciation and good humor during its induction ceremony Friday night at Barclays Center. “Lucky and grateful are two things I am every day,” said singer Eddie Vedder, the last of six Pearl Jam members to speak following a rollicking introductory from David Letterman. Letterman, who replaced singer Neil Young, who pulled out this week because of a minor illness, kicked off his speech saying of Young that “the truth of it is, the guy just can’t stay up this late.” Pearl Jam was the last of the seven performers to be honored, its presentation beginning more than four hours after the show began at 7 p.m.
Letterman’s introductory speech was equal parts honor and comedy. Letterman noted that Pearl Jam was on his show 10 times and that one of the things he misses in retirement is getting to hear live music daily. But he also referenced the band’s famous 1994 fight with TicketMaster and said that thanks to the band “every concert ticket today in America is free.” He also looked into the rafters of the Barclays Center and said “the entire balcony is filled with former Pearl Jam drummers,” a nod to the fact the band has had five. He then played on the opening song of the band’s set — “Alive” from the first album “Ten.” Pearl Jam also played “Given to Fly,” with current drummer Matt Cameron taking over, and concluded its three-song set with “Better Man” when they were joined by keyboardist Boom Gaspar. Former drummer Dave Abbruzzese, who was reportedly angry that he wasn’t inducted with the band, wasn’t in attendance. In honoring the band, Letterman referred to “Ten” as “a chinook coming out of the Pacific Northwest” and noted that it tapped into an unrest felt by many at the time. “I was almost 50, and even I was pissed off,” Letterman said. 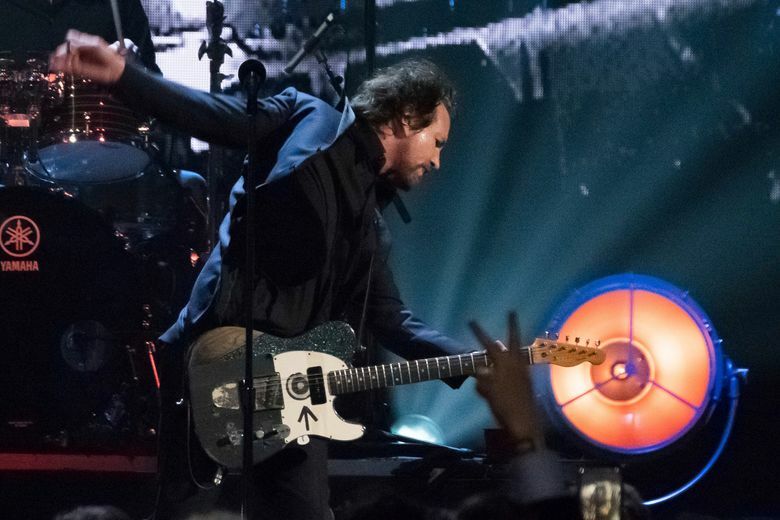 Letterman also told a heartfelt anecdote of Vedder appearing on Letterman’s last week of shows and leaving Letterman with a guitar for his son, Harry, as well as a handwritten note promising to get him a bigger one someday if he learned to play. While Pearl Jam had to wait until the end to be honored, its presence was felt from the beginning. In comments opening the ceremony, Rolling Stone co-founder and publisher Jann Wenner introduced each of the inductees, saving Pearl Jam for last. Wenner, though, hadn’t even mentioned the band’s name when a spontaneous standing ovation broke out and then a chant of “Ed-die” as Vedder was shown on the big screen. Wenner paused as the crowd chanted, Pearl Jam appearing to get the loudest ovation of any of the seven performers during the initial introduction. 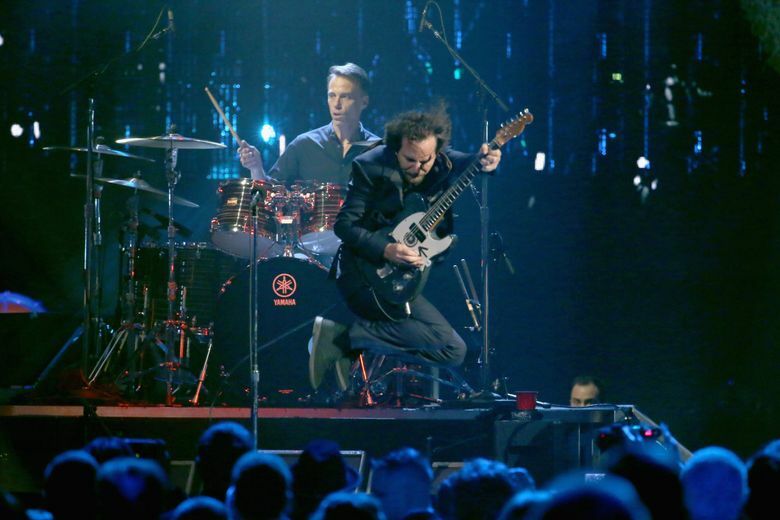 The induction of Pearl Jam served as another nod toward the genre-defining Seattle music scene of the late-1980s and early ’90s, even if the band didn’t necessarily fit neatly into the “grunge” definition. Nirvana was the first of the bands from that era to get inducted, honored in 2014. Others inducted Friday were ELO, Joan Baez, Tupac Shakur, Journey, Nile Rodgers and Yes. Journey’s induction was highlighted by the appearance of longtime singer Steve Perry, who last performed with the band in 1991. But while Perry gave a roughly six-minute speech, he did not sing during the band’s three songs. Among the Journey members officially inducted was founding member and keyboardist Gregg Rolie, who was born in Seattle. Snoop Dogg accepted on behalf of Tupac, calling him the greatest rapper ever. The show will be broadcast in an edited form at 8 p.m. April 29 on HBO.